Designed to lower personnel into confined spaces, such as bin or silo entry. We offer three standard Tripod sizes and a Quad Pod design. 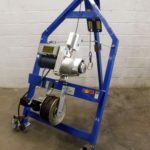 Easy setup and lightweight system includes “Spirit” Hoist Air or Electric, Frame, Wire Winder and Wire Rope with 175 FT. of travel. 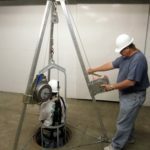 Work in bins, silos, man holes and other confined space access. Made in the U.S.A. manual and powered tripod hoist.